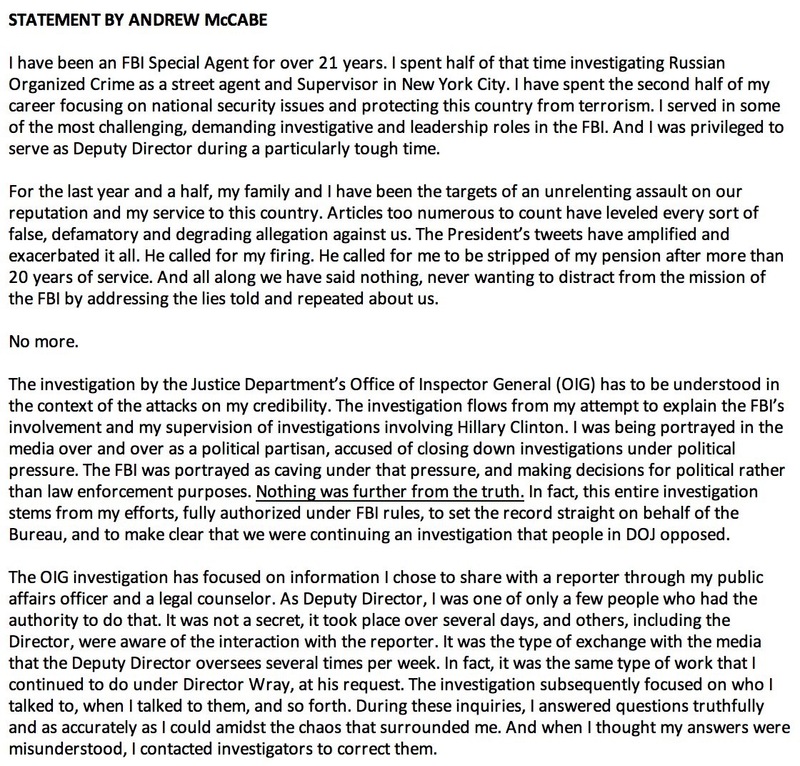 As best I can work out from the news, Andrew McCabe authorized the release of some information about the investigation into Hillary Clinton during the election. This was, apparently, something he had authority to do. 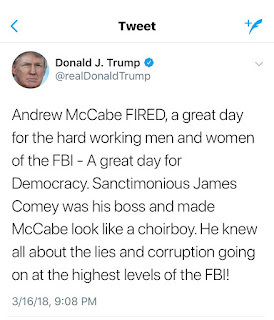 He then reportedly showed "lack of candor" during the subsequent investigation by the Inspector General, which was what led to his firing yesterday. The firing might have been justified, it might not have been. 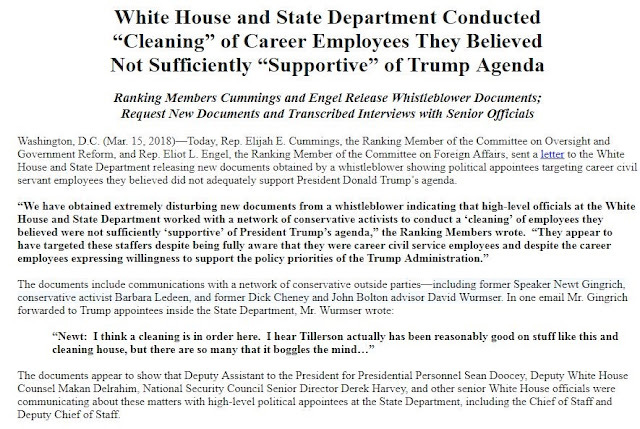 It's impossible to say without seeing the IG's report, which hasn't been released. 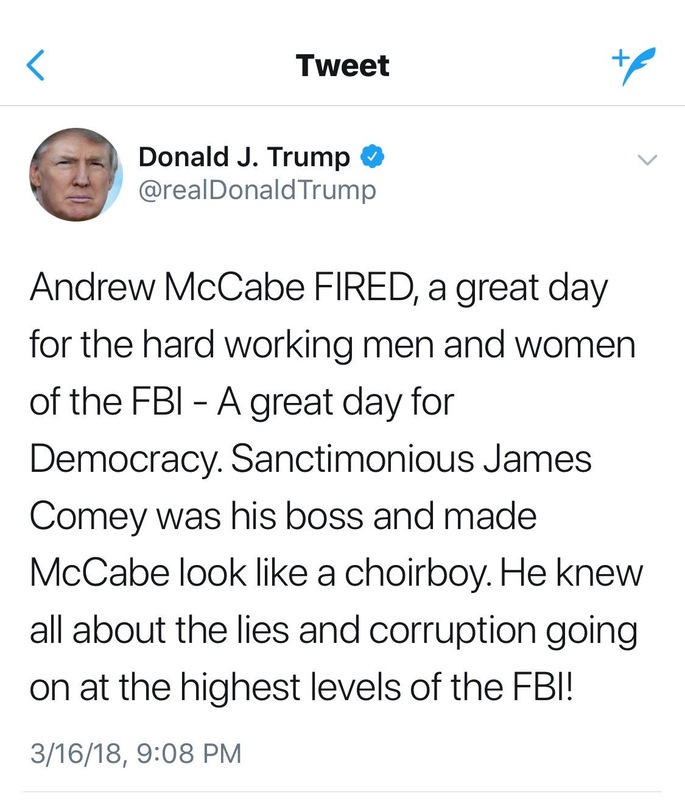 What can be said is that Donald Trump has had a hard-on for McCabe for months now, 1. because McCabe corroborated James Comey's damaging statements on Donald Trump in the obstruction investigation in front of the House Intel Committee, and 2. because Trump apparently believes McCabe is a pro-Clinton plant, due to his wife running for office as a Democrat. 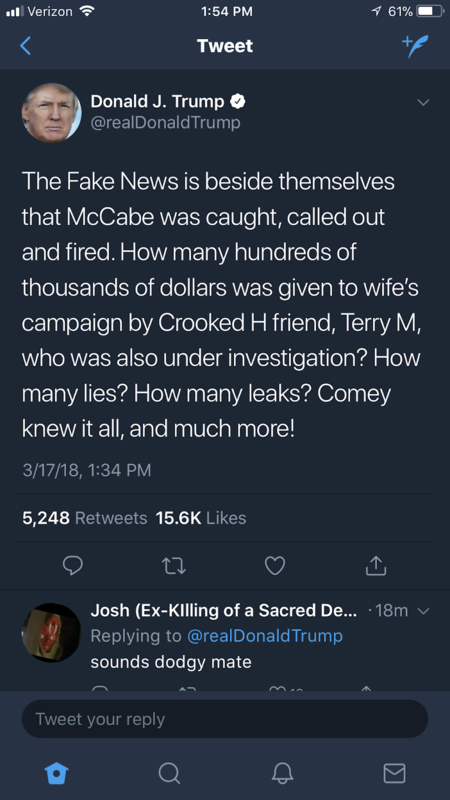 What can also be said is that Andrew McCabe was fired for lack of honesty, by an Attorney General who perjured himself in front of Congress, under the apparent direction of a President who lies to the American people on average four times a day. 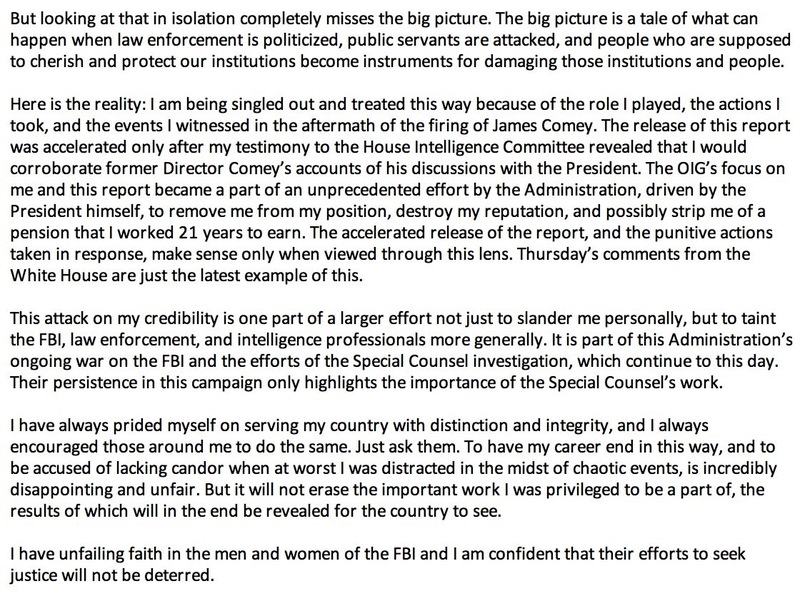 He has been denied his pension while Michael Flynn, who pleaded guilty to lying to the FBI while he was part of the Trump administration, continues to draw his. 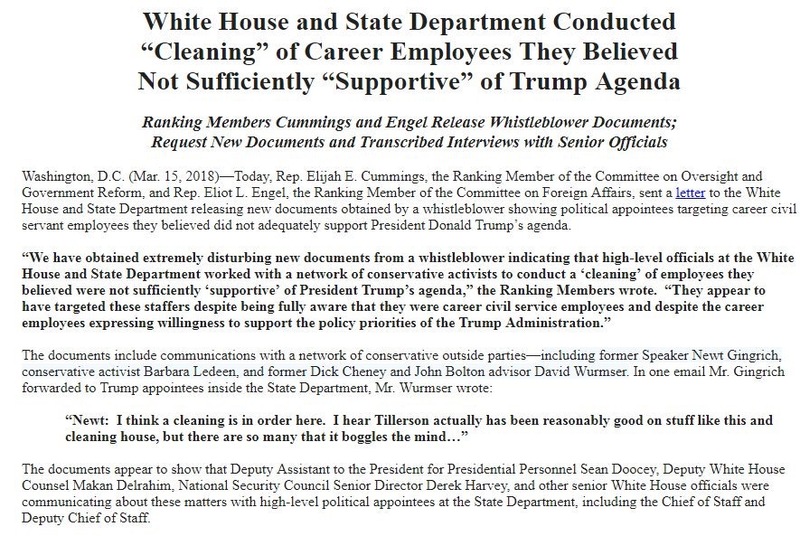 McCabe's firing came on the same day that House Democrats revealed letters from a whistleblower alleging an effort by Trump administration officials to purge the State Department of career employees out of fear that they were secret Obama loyalists. 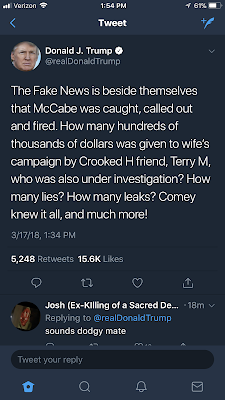 And it has been followed by statements from Trump which just about confirm that McCabe's firing was retaliation for his statements supporting Comey's testimony. And that has been followed by Trump's lawyer, on behalf of the White House (until it wasn't), calling for an end to Robert Mueller's probe into Russian collusion, obstruction of justice, and God knows what other crimes. 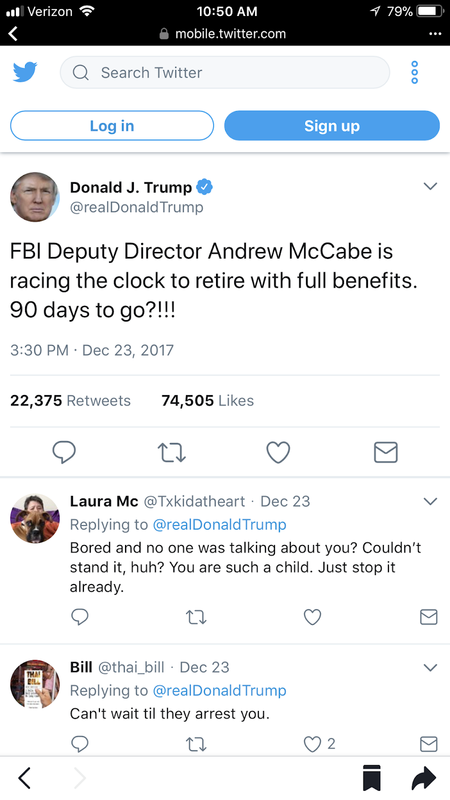 Regardless of whether McCabe deserved to be fired fast enough to deny a 21 year FBI veteran his pension, after what by all accounts were years of distinguished service, is almost beside the point when the sitting President is so grossly, obviously attacking a witness in a case that puts that same President in legal jeopardy. 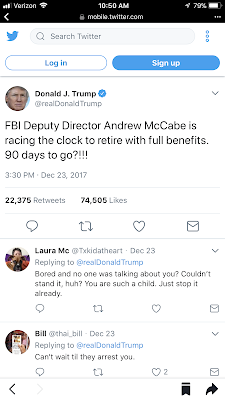 Donald Trump is unfit for office. And I hope yesterday's naked cruelty is part of what finally brings him down. 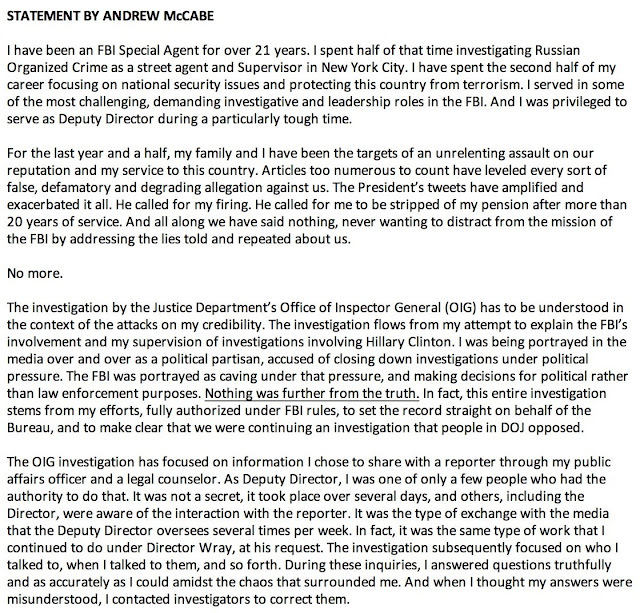 Below: Andrew McCabe's statement on his firing.